AeroBed Bed Basics by AeroBed, the official air-filled mattress of Drum Corps International, is the perfect bed for travel, guests, dorm rooms, apartments, weekend cottages and more. Bed Basics is made of puncture-resistant, heavy-duty PVC and comes with a detached, plug-in pump that provides hands-free inflation in less than 60 seconds. The patented "Quick Air Release Valve" deflates the bed in 15 seconds, perfect for the stop-and-go lifestyle of performers on the DCI Summer Tour. Take advantage of a special AeroBed offer. 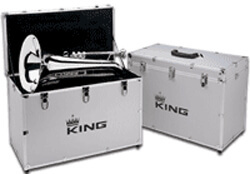 Conn-Selmer King Ultimate Marching Brass by Conn-Selmer, Inc., is a professional line of marching instruments designed for maximum projection while producing a full rich tone for ensembles. Built for durability to handle the challenges of outdoor use, King Ultimate Marching Brass is designed to provide peak performance all season long. Learn more at KingsoftheField.com. Wenger Corporation Introducing a new way to safely store and transport marching equipment, Wenger's OnBoard poducts are a complete line of storage, transport and performance carts developed with the marching ensemble in mind. 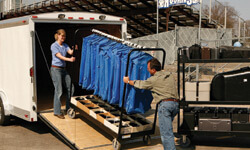 The OnBoard product line offers carts for uniform, cargo and percussion equipment. Each cart has been designed for indoor/outdoor rehearsal and performance environments. Wenger is currently offering six cargo or uniform carts for the price five or 10 percent off select products for a limited time only. Learn more about Wenger OnBoard products.